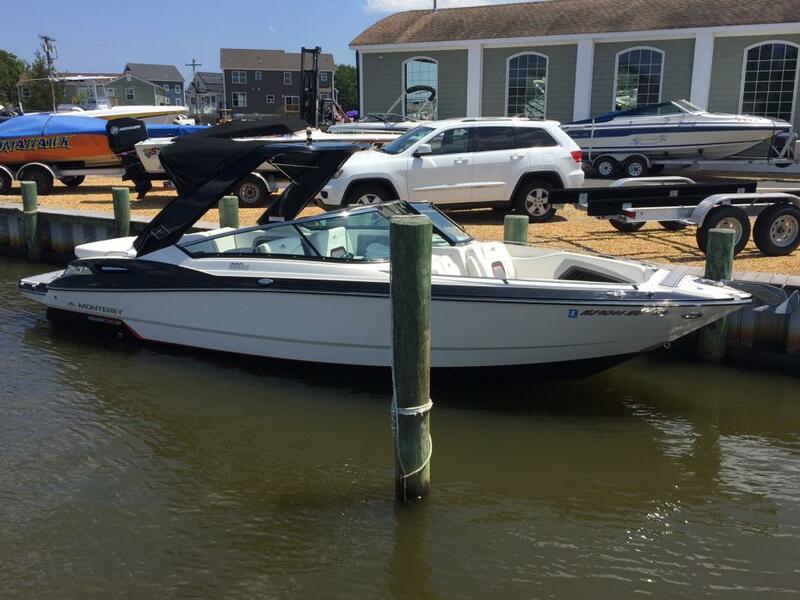 2015 Monterey 288 SS - Brand New Boat! Brand new!! Never titled or registered!! 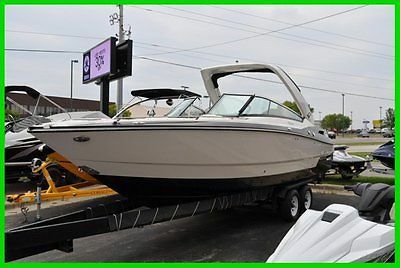 2015 Monterey 288SS Bowrider w/ Volvo V8-380 380hp engine and Duo-Prop outdrive! Included options: Swim platform Inlay(SeaDek) Docking Lights Cockpit Table w/ Pedestal & Vertical side mount bases Fwd. & Aft White, Electric Radar Arch, Fiberglass w/ Ski Tow & Aft Bimini Portable Platform Grill Anchor Windlass pre-wire Stereo Remote at stern Woven Cockpit flooring - Snap-in Battery Charger w/ Deck plug Bow & Cockpit Cover Toilet, Electric w/ Holding Tank, Indicator, and Pump-out fitting Bow filler cushions RayMarine E7d GPS/Chartplotter For a complete list of standard features, please refer to the manufacturer website, some minor changes may have occurred between 2015 & 2017: https://www.montereyboats.com/boats/supersports/298ss/ This is a brand new unregistered, untitled boat. Get a great deal on this leftover model! This model is the same as the re-badged 298SS. Please call us with any questions: C-JAM Yacht Sales 680 Bay Ave. Somers Point, NJ 08244 609-927-1175 sales@cjamyachtsales.com We work with several local and long distance marine haulers and can put you in touch with a reliable source for getting the boat transported. 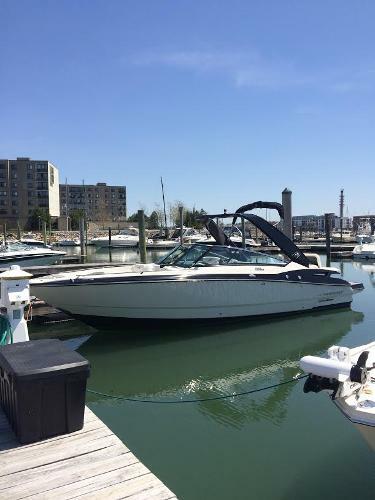 2015 Monterey 288SS Super Sport 288 Super Sport Combining luxury, technology, and performance, this beauty will change the way you think of powerboating. With a stable and comfortable 9 foot beam, the 288 comes standard with a roomy head compartment, and a huge aft seat stretching across the stern complete with flip-up backrest for lounging.Storage and seating are abundant! The full width electric engine hatch features a dunnage locker, our signature trunk storage, and Sun Island - the new aft facing flip-up backrest.Multiple cockpit configurations are available making this one of the most versatile party platforms out there. 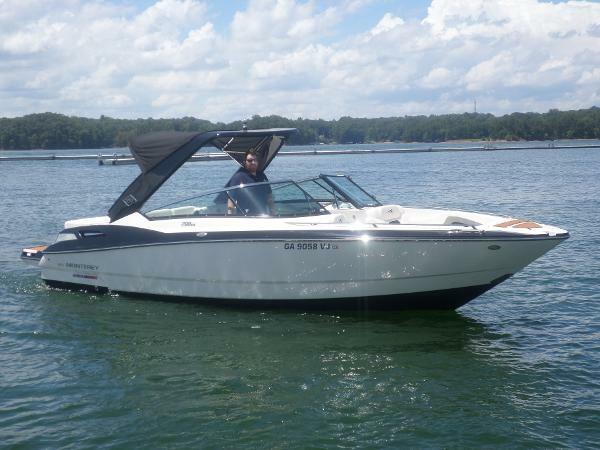 The 288SS can be equipped with either a wet bar or an aft facing observer seat maximizing room and comfort. 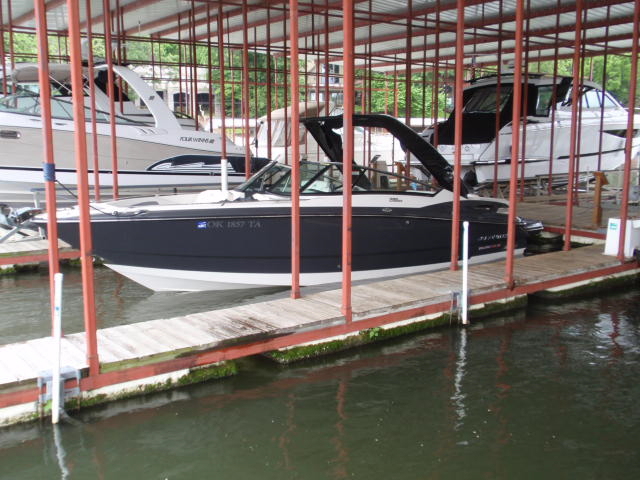 2013 Monterey 288ss, 2013 Monterey 288ss (now called 298ss)Meticulously Maintained! 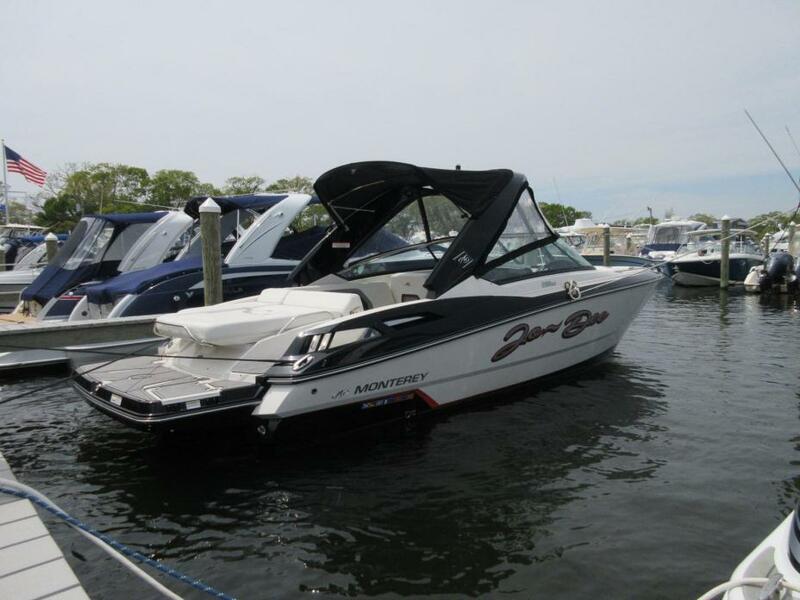 !Mercruiser 8.2 380hp with Bravo III Drive, GPS, Arch, Enclosed VacuFlush Head, premium Fuscion stereo system with 1 head unit and 2 remotes (bow and stern) bow filler cushions, Windlass, Battery Charger There is no cleaner 2013 29ft bowrider on the market that is cleaner than this boat! It is a BEST BUY for sure! 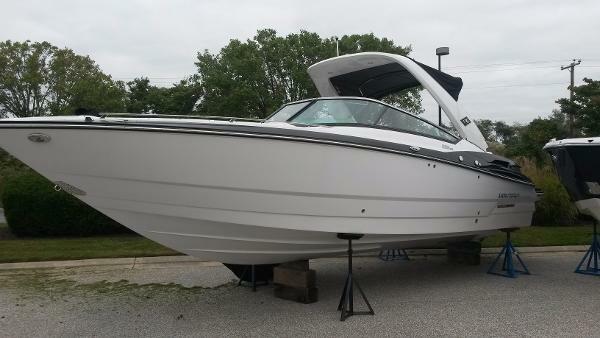 2014 Monterey 288SS, New Listing! 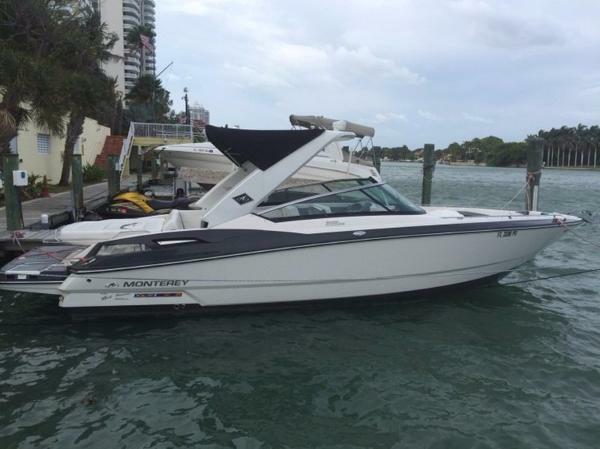 Marina Owned, Just Traded-In, Very Low Hours. Custom Pearl/Onyx X-Package. Garret Mclaughlin (507) 280-4696 5327 East Frontage Rd NW Rochester Minnesota 55901 ? ? ? ? 14 Monterey 288SS~~~Save HUGE!! !~~~BRAND NEW!! !~~~ TEXT GARRET Call or text Garret at 507-208-3492 for prompt and friendly service! Vehicle Information Year: 2014 Make: Monterey Model: 288SS Condition: New ? ? ? ? 1 of 38 ? View Large Images ? ? Description Audio Upgrade, Ray Marine E7D, stern Audio Remote, Cockpit Wet Bar, Cockpit Table, Windlass , Seadek, Hinged Arch, Docking Lights, Bow Filler Cushions, Quick and Quiet Side Exhaust, Ski Pylon, Batter Charger, Canvas FEES We take our 100% satisfaction score very seriously and want to ensure that you will have the best possible experience shopping with us. Please be sure you are fully aware of all stipulations of purchase before bidding. I'm a really nice guy and we will get along well, please feel free to reach out with any questions you may have! Please take note of message below! eBay Buy-it-Now or final winning auction bids DO NOT include all dealer fees and taxes UNLESS INDICATED!!! All powersports products are subject to $199 dealer services fee. All marine products are subject to $399 dealer services fee. Prep fees may also apply to new products. PLEASE CONTACT Garret at 507-208-3492 before bidding with any questions on total price. ?Credit Application ?Directions to Dealer ?Contact Us Options and Standard Features Basic Information Type: Bowrider Use: Not Specified Condition: New VIN: RGFCK191D414 Stock Number: MB-FCK191 Model: 288SS Make: Monterey Year: 2014 Length / Beam Length (Feet): 0 Exterior Color: Onyx/Black ? Apply Now Secure Credit Application Applying for a vehicle loan online is one of the quickest and easiest application methods. Our secure application is easy to complete, all you need are a few personal and employment details. 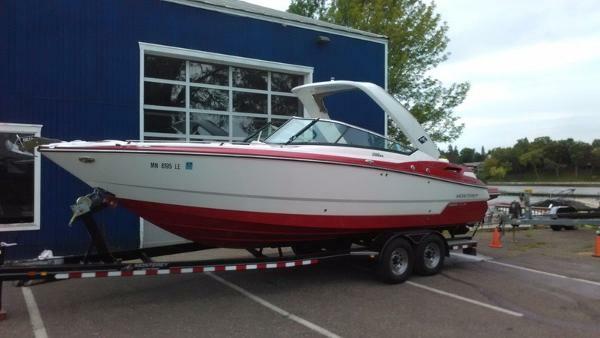 Contact River Valley Power and Sport - Rochester, MN 5327 East Frontage Rd NW Rochester Minnesota 55901 View Map Ask for:Garret Mclaughlin Primary Phone:(507) 280-4696 Contact: ?Contact Us Terms Placing a Bid: Your bid constitutes a legally binding contract to purchase this vehicle. Please do not bid if you're not seriously interested or financially able to purchase this vehicle. Please read eBay's User AgreementRiver Valley Power and Sport - Rochester, MN reserves the right to, Obtain and verify the registered information of all users who bid on this auction. Cancel any and all bids at our discretion, or end the auction early if necessary.Bidders Age: You must be 18 years of age or older to Bid. Special eBay Bid Retraction Rules: Please read eBay's "Retracting a Bid" If you place a bid before the last 12-hour period of the auction: You may retract that bid before that last 12-hour period but only for exceptional circumstances. You will not be allowed to retract that bid during the last 12-hour period of the auction. If you place a bid during the last 12-hour period of the auction: You will be allowed to retract the bid for exceptional circumstances but only if you do so within one hour after placing the bid.Funds & Financing: For help in arranging for a Pre-Approved loan or for any questions please e-mail or phone Garret at(507) 280-4696 prior to bidding. 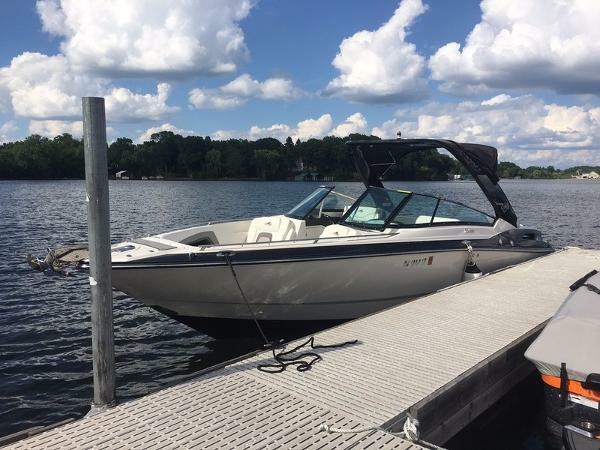 Buyers Inspection: River Valley Power and Sport - Rochester, MN has done our best to disclose all information known about this vehicle for auction. River Valley Power and Sport - Rochester, MN welcomes a buyers inspection. If you plan to have a buyers inspection, please make sure you inspect the vehicle prior to the auction ending. Inspection fees if any are Buyers responsibility. Representations and Warranties made by seller: This vehicle is being sold "as is". Manufacturer's warranties may still apply. Extended warranty may be available, e-mail or phone Garret at (507) 280-4696 for details. No representations or warranties are made by seller, nor are any representations or warranties relied upon by bidders in making bids. Taxes and Registration fees: Out of state buyers are responsible for all state, county, city taxes and fees, as well as title service fees in the state that the vehicle will be registered. All taxes and fees must be paid in full in order for vehicle to be titled and registered. Title Information: Vehicles titles may be held by banks or lenders as collateral for loans. In many cases there is a delay in receiving the original instruments up to 21 days from the time we pay a vehicle off. While we usually have all titles in our possession at closing, there are occasions where we may be waiting for them to arrive. If payment is made by cashier's or personal checks we will hold all titles for 10 days or until funds have cleared. Shipping & Delivery: All shipping charges are buyer's responsibility. River Valley Power and Sport - Rochester, MN will help with shipping arrangements but will not be responsible in any way for claims arising from shipping damage!Licensed Carriers are generally insured for $3,000,000.00. We assume no responsibility for damages incurred after the vehicle leaves our showroom. All shipping arrangements are provided by River Valley Power and Sport - Rochester, MN as a courtesy. We are not affiliated with any carrier. Any claims or other communication regarding shipment of vehicles will be between you and the shipper, not with River Valley Power and Sport - Rochester, MN. The amount of time it takes for delivery is dependent on the carrier, but is generally 7-14 days from the date the vehicle is picked up from our facility until it is delivered to your destination. Verify with the shipper for an Estimate Time of Arrival to be sure. Finalizing your Purchase: River Valley Power and Sport - Rochester, MN will contact the successful high bidder by e-mail after the auction closes. Successful high bidder MUST communicate with Garret at River Valley Power and Sport - Rochester, MN by e-mail or phone(507) 280-4696 within 24 hours of the auction ending to make arrangements to complete their transaction. If we cannot confirm your intention to buy or the sale is not completed within 5 days, we reserve the right to relist this vehicle or sell to any other qualified buyer. In order to secure bid on vehicle, Successful bidder (BUYER) must within 24 hours of bid closing send to Seller a Deposit in the amount of 10% by major credit card, cash in person or bank certified funds. Within 72 hours of bid closing, Buyer must send balance of funds by bank wire transfer, cash in person, bank certified funds to Seller. At time of sending initial deposit, Buyer MUST fax copy of their State issued valid Driver License. Furthermore, before said vehicle is released for shipment to Buyer, all other Sale related and title related paperwork must be signed and returned complete to Seller. Copyright © 2015 Auction123 - All rights reserved. - Disclaimer +- Auction123 (a service and listing/software company) and the Seller has done his/her best to disclose the equipment/condition of this vehicle/purchase. However, Auction123 disclaims any warranty as to the accuracy or to the working condition of the vehicle/equipment listed. The purchaser or prospective purchaser should verify with the Seller the accuracy of all the information listed within this ad. Selling a Vehicle? Create Professional Listings Fast and Easy. Click Here! 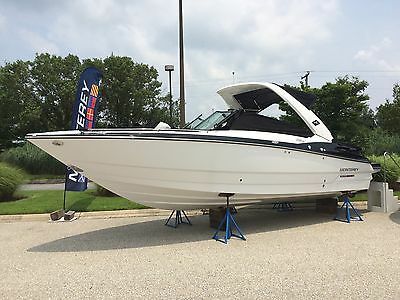 2014 MONTEREY 288 SS - BRAND NEW - LOADED! INVENTORY BLOWOUT SALE! ONLY 1 LEFT! 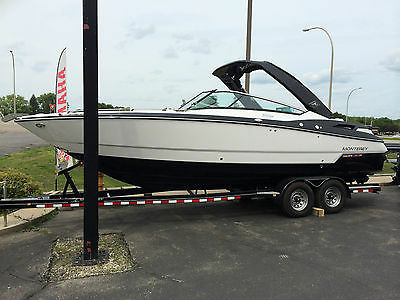 2014 MONTEREY 288 SS - BRAND NEW - LOADED! SUMMER CLEARANCE!!! OTHERS IN STOCK!